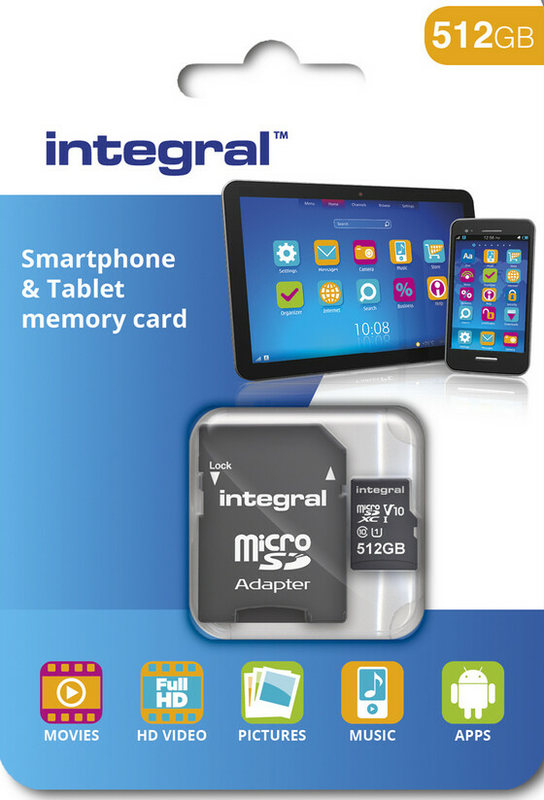 A U.K.company called Integral Memory will be the first to market with a 512GB microSDXC card. By inserting the card into a compatible microSD slot, users will be able to store content on it such as photos and videos. And with the large capacity of the card, users won't have to worry about having enough space on their handset to save a large library of photographs. These cards aren't just to use on your smartphone. Other devices such as action cameras, dash cameras and home security cameras also can use these cards to store photographic content, including videos. Consumers continue to favor using microSD cards over cloud based storage, and with the popularity of apps like Instagram and Snapchat, there is heavy demand for higher and higher capacity microSD cards. 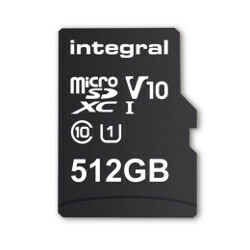 Integral's 512GB card features a Video Speed Class 10 rating, allowing for transfer speeds up to 80MB per second. Expected to be available for purchase sometime next month, the card will come with a 5 year warranty. Bring it on! SD cards support for the win! Just hope it's not absurdly expensive. 400GB UHS-1 card from Sandisk costs $250. This will likely cost 300 or above. Yeah, and the 200GB card was $250 or $300 at launch, prices will drop as storage continues to increase. MicroSD are too slow, when will UFS cards be compatible and available for our smartphones ? This 'micro-sd are too slow' thing again? Most casual users won't even feel the lag when they're using high-end phones. That 'slowness' will only be felt on lower tier phones. Oh, maybe I should buy the S9 since my S7 Edge is a lower tier phone. Samsung’s ufs 1.0 cards are already available to buy. I still haven't filled up my Samsung 256gb card yet.. Same here, can't even do 70% but new capacities are very good for price drops. Hoping the price on the 400 drops to $150 by the end of the year...fingers majorly crossed! And yet 400GB microSD card isn't available on the market. And most smartphones only supports up to 256GB of expandable storage via microSD card. How can you use the 512GB microSD card if there's no smartphone to support it? You're not paying attention. Most flagship phones from last year support up to 2tb sd but are advertised as 256gb. So yes same phones with support for 256gb currently support the available 400gb sd cards in market. LOL! Where's the proof that all last years flagship phones support up to 2TB SD card? Where's your proof that all of last years flagship owners have got a 400GB microSD card. And manage to run the storage without any problems at all? All manufacturers display all system specifications. So if the manufacturer states that it supports up to 256GB microSD card. It only supports 256GB microSD cards. So why would you put your phone on risk of slowdown by installing a bigger than 256GB microSD card on a not recommended phones? And you believe that their phones can do it? LOL! They're the same as samsung. So unless there's a proof that a 2TB is working on android with less than 8GB of ram. They're bluffing. This makes it much cheaper to add reasonable amounts of memory to the 2-in-1 laptops that are being sold with 128GB of onboard storage. The price will likely be much less than the alternative option of bigger storage from the manufacturer. I'm gonna wait for Samsung to make one. Theirs will probably be the best. Impressive. I remember when Compact Flash was the king of memory cards. SD (and Micro SD) cards were super expensive for the same amount of storage (which was around 2-4 GB). Now I can easily lose half a terabyte of data without even trying. More so for people who use GoPros and other action cams, this is great!